June 26, 2014, 12:38 p.m. In the Netherlands and in Germany, two closely watched startups have gone to readers to pay the bills. What lessons from there can be applied elsewhere? 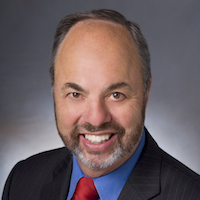 By Ken Doctor @kdoctor June 26, 2014, 12:38 p.m.
VIENNA — A small roar erupted in the crowded workshop. Krautreporter, with hours to go, had met its crowdfunded goal, gaining a commitment of €60 each from what would turn out to be 17,000 people. The €1.020 million ($1.38 million) raised means that Krautreporter will go live this fall. 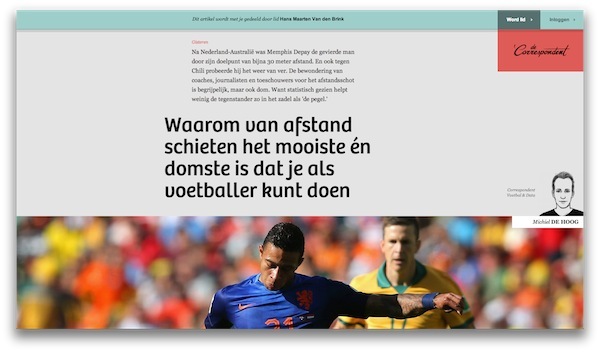 The new digital German national news magazine site is a fast follower to De Correspondent, the Dutch crowdfunded enterprise that recently burst into the public limelight (“A Dutch crowdfunded news site has raised $1.3 million and hopes for a digital-native journalism”), planned around a similar but not identical model. “I started [in the news business] when everything was going down hill.” That’s a simple but profound statement: Consider the sad tale of loss that has been the consuming storyline of the news industry for more than a decade, and its chilling effect on so much younger talent. Two big crowdfunded national news sites announced in less than half a year might not yet be a certifiable trend — three would be that lucky number — but the movement is nonetheless significant, with implications around the globe. First, it tells us that the reader revenue revolution is maturing. 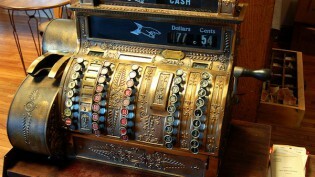 It offers more facets than the simplicity of all-access Paywalls 1.0. When asked to pay for well-reported news content, there’s a growing swell of readers who understand the value and are willing to invest in it. Call it a digital subscription, voluntary membership (public radio’s bread and butter for 40 years), pay-per-view, or crowdfunding: We’re seeing a renewed, if still small, consumer commitment to funding journalism. One great irony here: It’s the legacy companies who have proven out first that readers will pay for digital journalism, and the startups who are adapting that lesson. Second, these models are developing outside the United States. We’ve been the epicenter of news industry meltdown and the foundation of new reader-revenue thinking. Now nations as large as Germany (pop. 81 million) and as small as the Netherlands (pop. 16 million) are pioneering new models. In Germany, the development follows great recent change, in acknowledgment of digital disruption (“The newsonomics of the German press’ tipping year”). I’ve long heard the frustration of European journalists who chafe against the conservative corporate cultures of the news companies they work for — or used to work for. They’ve envied the startup culture of the U.S., even as the chaos of U.S. news has concerned them. At the same time, the funding cultures of Europe and the U.S. differ markedly. While foundations, led by Knight, have invested tens of millions in all kinds of efforts here, there is relatively little European foundation support for news startups. Similarly, venture capital isn’t betting much on non-English-language news startups. 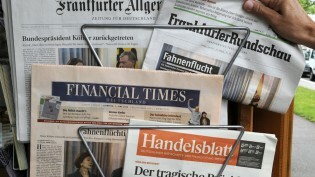 “There isn’t a market to make serious money [on news] in Germany,” says Esser. In fact, the global competition, from The New York Times to Le Monde, further eats away at the reading time of German news junkies these days, Esser says. Also complicating funding efforts: In Germany, those giving to nonprofits like Krautreporter receive no tax deduction. Crowdfunding recognizes this landscape and aims to find uniquely German and Dutch answers to it. The Netherlands, in particular, offers a great optimistic lesson for 2014. Three out-of-the-box initiatives have burst out this year alone. There’s De Correspondent. There’s fast-moving Blendle, which has put together a Dutch pay-per-view business and just signed The Economist as a customer. 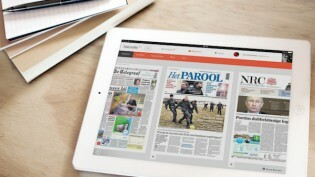 Then there’s NRCQ, a Quartz-like mobile business product coming out of NRC, a major Amsterdam-based legacy newspaper. (“The newsonomics of three cracks at the mobile puzzle”). Third, both new crowdfunded sites position their journalism at a more atomic level than traditional brands: They are built individual by individual, with each “correspondent” a draw unto herself or himself – with the collective hoping to offer a big enough value to justify support. At first blush, it’s easy to define the “new European crowdfunding” phenomenon, and let it go on that. Yet the differences just between these two startups tell us a lot about all the vital choices that must be made in designing the new digital journalism. De Correspondent has developed the more sophisticated model in its short life; Krautreporter has a steep learning curve, as its celebration wears off and the tough work of building the product has begun. Already, German press critics are suggesting that Krautreporter may have bitten off more than it can chew. De Correspondent has big ambitions, built on a now-solid foundation. After a record-setting raising of more than €1 million in eight days, spurred by a TV appearance, the site launched at the end of September. It now claims 33,000 subscribers and an overall full-time staff of 14, including nine full-time writing staff. In addition, it pays 16 additional contribution writers. Its site, translated to English via Chrome, displays a pluckiness and an authority now more common in recent news startups. It has significantly increased its reach in in its nine months. De Correspondent reports traffic holding “steady” at 450,000 unique users, 1.5 million pageviews, and 900,000 sessions. That significant growth in members has been driven with viral sampling. Members can share an unlimited number of stories with friends, with the shared story bannered at the top to identify the friend and explain the Correspondent funding model. So far, 8.500 members have shared one article or more. That viral sampling strategy is also one very much in evidence from The New York Times to Netflix, as paying for digital content models get shared across a wide landscape. Editor Rob Wijnberg makes the point that news companies have been producing the same kind of company the same way for hundreds of years. De Correspondent aims to move from “news to new,” offering up “new insights in how the world really works,” Wijnberg told the audience at a Vienna workshop of fjum (#MID14: Building Blocks for the New News) on the day the Krautreporter achieved its funding goal. Wijnberg quotes a Dutch colleague: “If you read the news through the day, you will understand how the world doesn‘t work.” De Correspondent aims as much at understanding and solutions as in pointing out the problems. Its correspondents are chosen for both their journalistic abilities and knowledge, covering areas from society and economics to literature and football. Education correspondent Johannes Visser has worked as a teacher, for instance. The correspondent’s task: becoming a “conversation leader in their fields.” That means all manner of longer-form and short-note reporting, as well as “working with readers who have an expertise in their fields.” Of the full-time correspondents, ages range from 25 to 45, with most around 30. 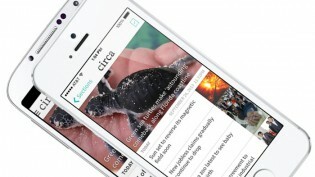 It’s a completely contemporary site: led by high-profile journalists, oriented to mobile, built around explainers, aimed at solutions, meant to encourage two-way conversations. You can see echoes of everything from Vox and FiveThirtyEight to Quartz to Gawker to The Guardian within its vision. De Correspondent doesn’t suffer from a lack of ambition. For the colorfully named Krautreporter, life is an open canvas. Its core staff is made up of seven largely full-timers, including media magazine Vocer founder Alexander von Streit as editor in chief. In a sense, it’s more of a co-op: Its 25 journalists are part-timers, to be paid about €2,000 to €2,500 a month, which means they’ll likely need to be otherwise employed. Will Germany’s major publishers allow their best people to moonlight for Krautreporter? Sebastian Esser believes they will, but my talks with a couple of them indicate that they may be less than cordial to the idea. Those correspondents will be spread throughout the much larger geography of Germany. “We won’t tell that what to write,” says Esser. “We are just doing a quality check. We provide them with the means to do their jobs.” Krautreporter’s contributors are drawn from legacy media. “Nearly all of them have newspaper backgrounds,” says Esser, and “most have a digital background,” having blogged or participated in digital projects. Krautreporter’s pieces will be longer and in-depth, with each contributor expected to write a single piece a week. 25 writers means five new pieces day, roughly. The emphasis is most on longer-form reporting, less on commentary. Esser has moved on one glaring demand, quickly. Krautreporter started with no social presence and heard about it from members. Consequently, three of the core staff are now at work around audience, analytics, social engagement, and events: “They will know more about our crowd. They will know more than me.” Engagement can be trickier in Germany, given culture and habit; it possesses one of the lowest Twitter adoption rates globally. Esser describes the site as a club in progress. He’s painfully frank: “I’m not sure we will make it beyond a year.” His goal: to build the membership list to 30,000. It’s a club with a self-mocking name. Kraut is an Americanism, a once-derisive term for Germans, short for sauerkraut. You’d have to turn to such fare as the ’60s sitcom Hogan’s Heroes or war movies to hear it. Yet Esser and his cohorts have chosen it believing it shows a sense of flexibility and not taking themselves too seriously — unlike traditional media. Sebastian Esser cites, and gives credit, to numerous influencers, some more obvious than others. At the top of the list is Der Correspondent. Others include Andrew Sullivan’s pioneering crowdfunding initiative of last year, David Cohn’s Spot.us, and the successes of The Texas Tribune, MinnPost, and NPR. On the latter, he cites not only NPR’s overall reporting quality and membership structure, but NPR Berlin, an outpost of NPR few of us know about, but which served as an inspiration. You can start to see the curious ways in which upstart journalism on two continents has become a loose support group. A comparison of De Correspondent and Krautreporter is highly instructive for all news startups, and others designing new digital strategies. What’s big, and in common, for both sites: the ability to choose its own staff, presumably creating its own culture, rather than spending years or decades trying to change an existing one. For De Correspondent, with a full-time staff, based largely in Amsterdam, that value will be greater. The differences between the two sites, though, may be important distinctions as both work toward becoming sustainable businesses. Crowdfunding can be a great Year One strategy, but offers few clues to Year Two and beyond. To that end, De Correspondent’s model here is much more mature, and likely more strategic. The basic editorial model of staff-based “conversation leadership” would seem to be much stickier than Krautreporter’s more singular form of longer articles. Further, its paywall — combined with viral sampling — should offer a better onramp for growth. What does sustainability look like in nonprofit journalism? The business takes exceptional smarts to make work. We know crowdfunding is only a jumpstart. Think about the various efforts we’ve seen out of the chaos of closed newspapers, in cities like Seattle and Denver, to build new independent news sites. Many have foundered. The key reason: Editorial fervor is great kindling, but failure to build and operate with the discipline of any small business has been the culprit. It is now sad conventional wisdom that the vast majority of new news startups still are editorial-heavy, and too innumerate to build a future, as a Knight study found last fall. Sebastian Esser’s description of Krautreporter as a would-be club for serious news readers may be a good overall description for this growing phenomenon. Membership, very much in vogue in the news world, offers a new gathering place for the news-aware, and even such developments as the new Knight-funded audience engagement platform plays to the same idea. The big questions: How many clubs will there be? How many members will find accommodations for which they are willing to pay? Are they only for groups of like-minded readers? The day of those questions — both in 150-year-old legacy media and in one-month-old German crowdfunded startups — is upon us. 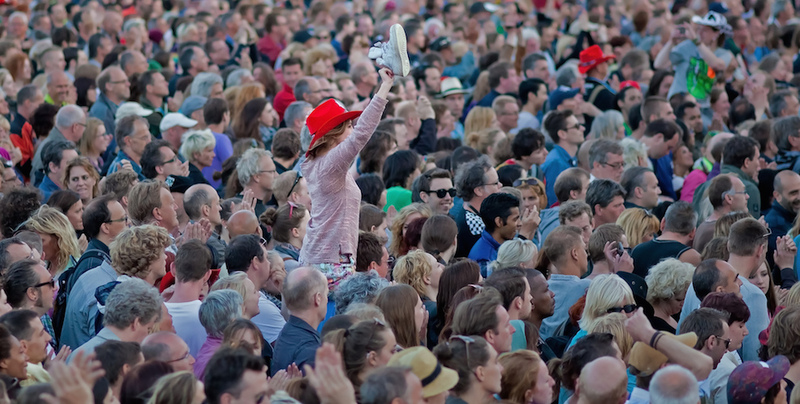 Photo of a Dutch crowd — at a 2013 music festival — by Maurice used under a Creative Commons license. POSTED June 26, 2014, 12:38 p.m. Doctor, Ken. "The newsonomics of European crowds, funding new news." Nieman Journalism Lab. Nieman Foundation for Journalism at Harvard, 26 Jun. 2014. Web. 19 Apr. 2019. Doctor, Ken. "The newsonomics of European crowds, funding new news." Nieman Journalism Lab. Last modified June 26, 2014. Accessed April 19, 2019. https://www.niemanlab.org/2014/06/the-newsonomics-of-european-crowds-funding-new-news/.